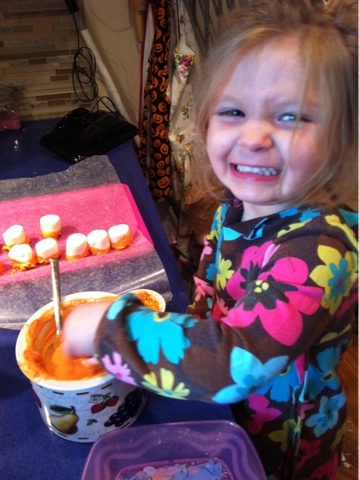 B thrives in a hands-on learning environment, particularly in the kitchen! We have started to do simple addition and subtraction while working in the kitchen using delicious goodies that she creates! This past week we did Marshmallow Math. 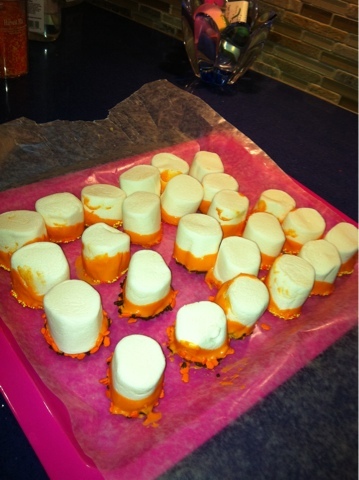 While the orange candy coatings were melting B counted out 10 marshmallows to be dipped. Once the original 10 were dipped the math began! 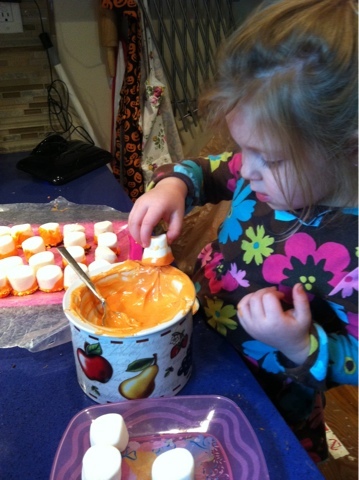 It's amazing how quick she could add or subtract when marshmallows were the ante! When the lesson was over (the candy coating ran out) she then counted out 5 marshmallow treats to put in a treat bag for her Nonna & Nonno. As I was tying the bow she said "I hope Nonno and Nonna like their treats!" A second lesson was completed...the lesson of gratitude in giving.